Arizona House Democrats: Putting kids first should be more than a catchphrase. Putting kids first should be more than a catchphrase. People across the state are still calling for more to be done to improve education for Arizona kids. And we are still hearing nothing from the governor's office about what he is going to do to correct the challenges facing our schools. Recently, an Arizona Republic piece pointed out that Arizona Superintendent Diane Douglas' AZ Kids Can't Wait education plan to get more funding for schools and teachers was "nice" but was wouldn’t do much to move the ball forward. "It would be nicer still if she launched a crusade to actually get it… to follow up and pressure Gov. 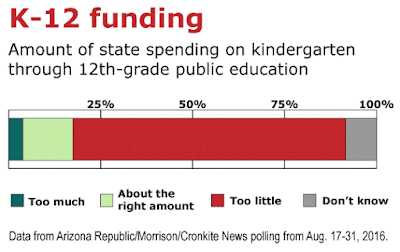 Doug Ducey and the Republican-led Legislature to properly fund schools." The governor and other Republican leaders promised that Prop 123, which got some of the illegally withheld inflation funding back to schools, would be a first step. But we've still not seen step two. 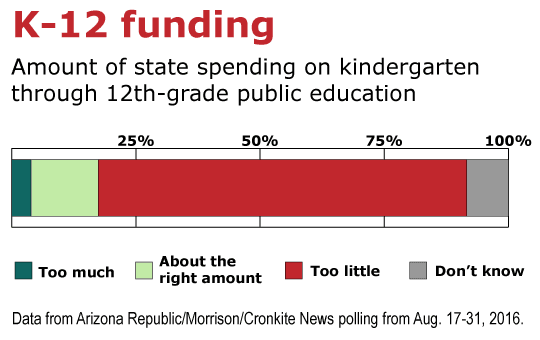 A poll from the Morrison Institute for Public Policy and ASU's Walter Cronkite School of Journalism and Mass Communication show the most Arizonans believe the state is spending too little on education. Arizona continues to rank near the bottom nationally for public school student spending and an official from the Arizona Department of Education recently said Prop. 123 money won’t be enough to boost the state’s standing. So if the Republican leaders in this state really believe "AZ Kids Can't Wait," then it's time to make some choices that will make school funding a priority, not just a catchphrase.